Katarzyna’s story in development economics began with a Trans-Siberian trip to Mongolia back in 2000, which marked the beginning of a lifelong journey trying to help resolve world’s pressing developmental challenges. Since then she has been exploring developmental issues both in academic theory and on the ground, carrying out field research and volunteering in developing countries and emerging economies. Combing her academic knowledge with first-hand experience in numerous developing countries on all the major continents has given her an in-depth understanding and comprehensive overview of developmental issues. Her global perspective intersects with a local perception of people and societies, acquired over the years in remote areas across the globe. Katarzyna has lectured at universities in Europe, Asia, and Africa and has advised and provided consultancy for national and local governments, the European Commission, and other public and private institutions in Europe and worldwide. She has led or participated in a number of research projects for the European Commission, the National Bureau of Research in Poland, and other international institutions and recently finalised a project on the economic potential and developmental possibilities of developing countries in Africa. Her work has earned her numerous awards, including one for outstanding young scholars from Poland’s Minister of Science and Higher Education in 2012. She has published on issues relating to development, governance, integration, and regional cooperation. Her recent co-edited book “The Rise of Megacities: Challenges, Opportunities and Unique Characteristics” has been published by World Scientific in 2018. Katarzyna was a research fellow at the Graduate Institute of International and Development Studies in Geneva in 2011–2012 and at the J.F. 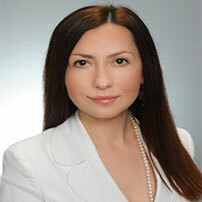 Kennedy School of Government at Harvard University in 2013–2014, while currently she is assistant professor at the Poznan University of Economics and Business and a member of the “Poland 2000 Plus” Committee on Future Studies, Polish Academy of Sciences. She is a part of the European Young Leaders (EYL40) family, Class of 2017.